An innocent father/son hike yields deadly consequences. Yup. I'll admit it. "The Burning Tree" from writers Keith Chamberlain and Frank Juchniewicz was not at all what I was expecting. This short film is a perfect example of an excellent concept brought to life. For any of it's short comings, being an indie low budget film, this title more than makes up for it with it's slightly twisted ending. What's more is that it manages to pack a lot of intellectual punches, as it bull dozes through it's nine minute length. When you can honestly empathize with the lead character to some extent, regarding a horrendous action he performs... you know this is a good film. It also, in a veiled way, asks some pretty tough questions from all of us. Just how important is a stable home life? Can the actions of parents and even, to some extent, other kids truly cause an emotional and mental tear? One strong enough to contemplate murder? You may find yourself questioning things like: how much does it take to actually break a person? Does a person need to already suffer mental issues, known or unknown, in order to contemplate a horrible action? Does the shaken, not stirred cocktail of life experience make one crazy enough to kill? Or, does there have to be an entire mix of preexisting mental factors, that compound what would normally be a "brush it off" kind of scenario. All these questions exist within "The Burning Tree" either as straight out truths, or as hypothetical questions. And these questions ladies and gents, are what make this such an interesting short film. On the technical level, this is pretty much what you'll expect from a "good" low budget film. Nothing great or ground breaking, but put together well. Some of the audio in the dialog was a little weird sounding, but I expect this was the ADR mix for the wooded shots. The pacing and framing of the story were handled nicely, revealing just enough at a time to keep things interesting. As for the actors themselves, nothing Oscar worthy but easily enough to get the job done. I did notice that aside from the poster art... I never really got to see the tree. However, that's just splitting hairs. Who does that anymore? Generally speaking, as a full production, "The Burning Tree" manages to climb that independent ladder, and play like a short film with a higher budget than it probably had. Nice work overall. To those both in front of, and behind the lens. 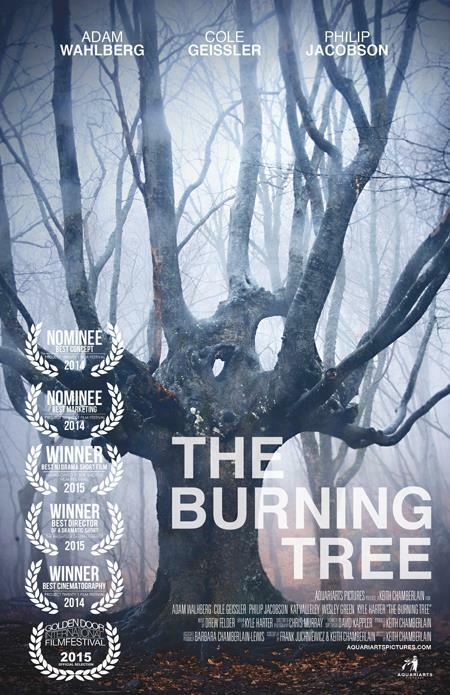 "The Burning Tree" is a film that really owes it's stars to the clever concept. Although put together well enough, it's the story and the questions afterward, that really give it an edge in our little world of indie film. Clocking in at just under ten minutes, excluding credits, this is a quick, easy and entertaining film. Sure to do the trick whenever you feel the need for a small film fix. As I wrote above, the story is put together in just the right way, to keep you watching and interested. Maybe even a little surprised at the end. This isn't one of those huge shocker endings however, just one that you won't see coming... and will make perfect sense. Excellent job to the writers, cast and crew. A well done short film all around.